So everyone from the Houston area knows that Conroe is a city of about 75,000 located 40 miles to the north. What you might not know is that Conroe got its name from a union cavalry officer, Isaac Conroe. Back in 1881, Captain Conroe saw the heavily wooded landscape (just east of the current city center) as an opportunity. He opened a sawmill, which quickly became very successful for two reasons. First, raw material for his product was right on the property. Second, and of equal importance, his sawmill was at the junction of both east-west and north-south rail lines – the only such spot in the county. As you might expect, Conroe prospered and was soon a shipping center for lumber, cotton, livestock and bricks. By 1900 it was the largest community in the county, with a population of nearly 1,000. Conroe to continued to grow with a substantial boost from the oil and industry. Once the section of Interstate 45 linking Conroe to Houston was completed, homebuilders discovered the area as a convenient commuting community from employment centers, and more families began to like what they were seeing in this city by the lake that bears its name. 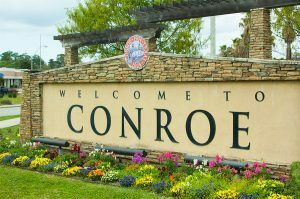 From a total population of about 29,000 in 1990, the city grew to 39,000 by 2000, 58,000 by 2010 and today, nearly 75,000 people call Conroe home. These 24,000+ households have a median income of approximately $50,000, and while they are blessed to live in the great state of Texas, they still have the same needs and concerns as any other group. At the Essex Law Firm, we have been serving clients in Conroe and the surrounding communities for over 30 years. We know this area because we live here too, and many of you are our friends and neighbors. We want to be your first choice if you need assistance with any issues pertaining to family law. Whether you need guidance on divorce, child custody or support, adoption or termination, small estate wills or probate, call us. We promise to provide an informative initial consultation so you are totally informed about all aspects of your inquiry. We will communicate effectively so you are always informed, and our services are affordable. Many of our clients in the Conroe area pay a fixed fee for their cases. There are never any “gotcha” moments with the Essex Law Firm. Feel free to contact us if you have any questions on the services we provide to the residents of Conroe and surrounding communities.